Do you have a feeling that the day with blue sky and white cloud is less and less? Why? The answer is very simple, because the environmental pollution, especially air pollution, is more and more serious. For example, the congested traffic in rush hours produces a huge quantity of exhausts that directly result in air pollution. At the same time, the blue sky and white cloud disappear from then on. Changing lifestyle and travel habit is the way out, and Fosjoas intelligent self-balancing electric scooter play the key role. All of Fosjoas electric scooters are equipped with advanced SONY lithium-ion batteries with different capacities. That is to say, they are powered by electricity, which is different from gasoline-powered automobiles. Riding Fosjoas electric scooters won't generate any harmful gas and thus they are environmental-friendly. 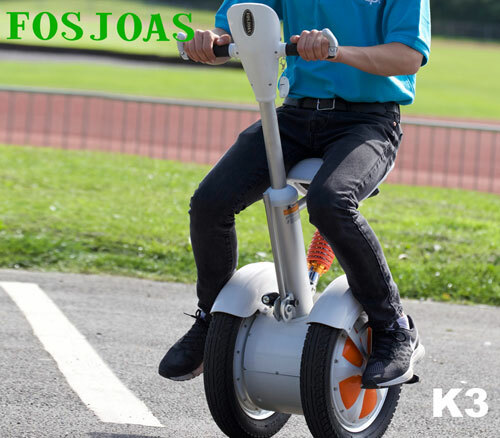 More importantly, Fosjoas self-balancing scooters are energy-saving. Generally speaking, the battery capacities of Fosjoas electric scooters are between 88.8Wh and 680Wh. According to practical test, they cost about 1Kwh or 2Kwh every 100km and they are highly praised as the "environmental-friendly and energy-saving ambassador". Besides the advantages of environment protection and energy conservation, Fosjoas electric scooters really can do a lot for people. Briefly speaking, Fosjoas electric scooters are Jack-of-all-trades, because they have many different scooter types, such as single-wheeled, twin-wheeled and two-wheeled scooters, U3 SUV scooter, K3 sitting-posture scooter or K1 electric skateboard and so on. Therefore, whatever age group a person is in, he or she always can find a suitable scooter type. Fosjoas self-balancing scooters can be used as transports for both short-distance and long-distance travels. For example, people can ride them to go to work or to school every day so as to avoid traffic jam in rush hours. Meanwhile, people also can ride them to enjoy the leisure time with friends in the open air. All in all, Fosjoas electric scooters not only can return blue sky and white cloud to people, but also are sweet life helpers.